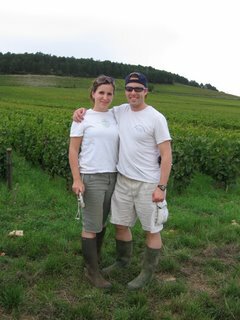 My sister Jayne and my future brother-in-law Mark arrived in Beaune on Tuesday, and by Thursday we had them dressed up in their rattiest clothes, hats on heads, and sequeters in hand to cut grapes with Franck at the family Domaine of our friends Charlotte and Marco in Volnay. The harvest is in full swing here since the beginning of this week. Tractors full of grapes clog up the roads, the vineyards are dotted with harvesters, and the redolent scent of crushed grapes fills the air. I love it. Even though I didn’t cut grapes myself this year (someone has to hold down the fort, feed the kids, etc.) just being here makes me feel like I’m part of something big and important. Jayne and Mark were game and endured with a smile sore backs, bunches of rotten grapes thrown at their heads (all in good fun, bien sur), and HUGE spiders, according to Jayne. The reward at the end of the day is not only bragging rights that they particpated in harvesting some of the world’s most prestigious grapes, but also a tour of the Domaine’s impressive wine caves and a select tasting of last years’ wine, straight from the barrel, that so far only Marco’s closest family members have had the privilege to taste. Ah, the best treats are those you have to work for! And we sure picked the right day. Today we woke up to pouring rain, which translates to knee deep mud between the rows of vines. This entry was posted in Uncategorized on September 23, 2006 by admin.